My nephew wanted a Star Wars cake for his fifth birthday, he decided on Yoda. I started by baking the sheet cake with four boxes of Pillsbury cake mix, two yellow and two devil’s food. I tinted the yellow cake mix green for Yoda, the green cake freaked out some of the kids but they enjoyed it anyway. 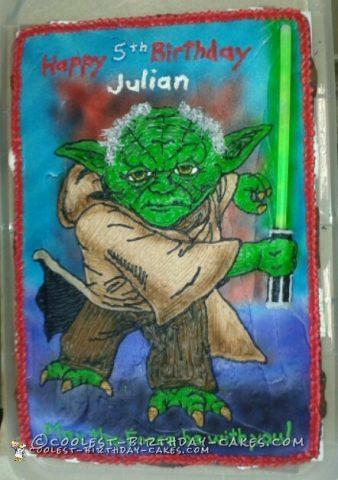 I iced the cake with Pillsbury white icing and airbrushed the background so Yoda would stand out. I free handed Yoda from a picture I found on the internet using Wilton pastry bags with round decorating tips #1, 2 & 3. After I finished drawing Yoda I shaded him with the airbrush. I trimmed the cake using a star tip. 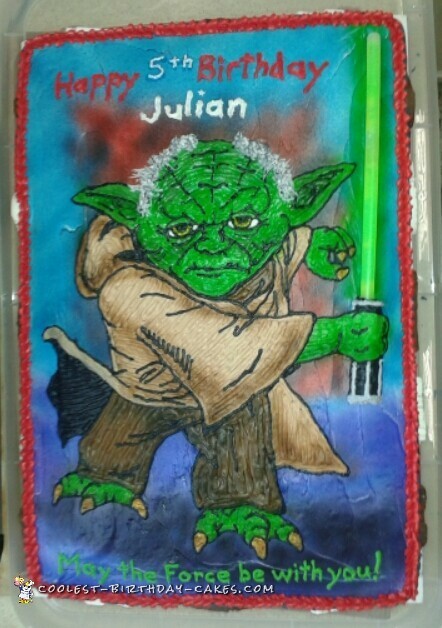 I added a glow stick for the lightsaber blade, that was my nephew’s favorite part of the cake. I made chocolate Star Wars ships for the side of the cake using Wilton candy melts and a silcon ice cube tray. Everyone really liked the cake.